If you run an e-commerce website selling a large volume of products then Google Product Feed can really increase your audience figures. Google Product Feed is relatively simple to set-up and is provided FREE by Google. It allows Google to see what it is your selling, and list products accordingly within its search results. For Weeton's, one of our digital and print clients - we have synchronised our products with Google Product Feed. What this means in real terms is that when someone does a Google Search for 'brie baker' we come top of the list. It can be very profitable to be top of a specific product search term because customers who are already aware of the product and are searching for it directly are usually ready to make a purchase. The other great part about Google Product Feed is that we don't just come top of the list - our picture of the product is also shown in the search results. 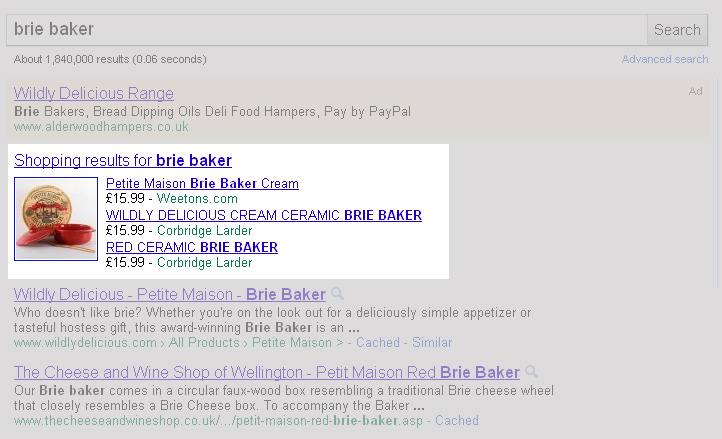 For those, interested in buying a brie baker - it's a great result from the leading search engine. Please click on this link if you're interested in a Brie Baker - they are a very popular and a great way to serve brie!